It's been a long time since I have posted. Some of it is time, but some of it is that I haven't had the heart to write. This has been a time of ups and downs, wins and losses, giggles and tears. We are riding a roller coaster and while the ups are so exciting, the downs can make you sick to your stomach. Saoirse handled radiation like a champ. She finished it out, and everyone could see the major improvement in her head and eye tumors. She was eating and playing, even though she was sleepy. We finally felt like we were making some headway. She was visibly getting better, and we were glad to start to see our little girl come back to us. Then we had a turn. She went into clinic and her electrolytes were all off. Her Sodium was low, her potassium was low and she was constipated. We were back in. This was rough because Mikes parents were in town, and I felt horrible that they were going to miss so many days with her. They gave her IV boluses and she started to perk up. She ate, pooped, played, pooped, and ate some more. Her levels went up, and they took her off of her hydration and she was truly Saoirse for six glorious hours! We had our baby back! She was running, and giggling and playing and laughing out loud, and talking and interacting. It was amazing and i was so excited to see her like that. I spent practically the whole time upset at the doctors and nurses and didn't enjoy it as much as I should have. It was short lived. After her nap, she was miserable again. They checked her labs and her sodium had dropped. They waited it out a bit longer to see if she would rebound, but she stopped eating, stopped playing, stopped pooping, and it was back to lying on the floor and force feeding. With a later lab check, her sodium had dropped, and they put her back on fluid and started to work on a new plan. Admittedly this was the worst night for me. I was frustrated, upset, angry, sad, defeated... the list could go on. She is so fragile, and I just want her to feel better. I am sick of the hospital stays and the unexpected changes. The unknown is so hard to deal with, and right now, that's all we have. There is no plan, its wait and see. I'm sick of waiting, and "seeing" never seems to pan out to anything good. I felt like I wanted to give up, to stop torturing her with the treatments and the hospital stays, and the poking and prodding. But she didn't deserve that either. I talked to the doctor, and she explained the plan, and I felt much better about how they were going to handle her treatment. She came home with us the next day, on a new plan, and I was hopeful that she would start to perk up in a couple days. We had a few glimpses of her playful side, and she seemed to maybe be turning around. But it didn't last. She was having constipation issues, and we tried and tried to reduce her bloating. By Monday, she seemed so full of gas, that we thought she might have a true obstruction. We were worried that it would be toxic if she didn't move it quickly. We called and asked to see a gastroenterologist, and we were sent for an ultrasound at the peabody children's location. They saw that her liver was enlarged, and that one of her veins was narrowed and causing her to retain fluid. They said they didn't see any masses, but that it was concerning that her liver was so large. We were called in for a CT the next morning, and lab work in the afternoon. More hurry up and wait. We were frustrated that we had to initiate the scans and that the doctors hadn't expressed any concern for her large belly on Monday when we were in clinic all day. If its not one thing its another, and we are just tired of all the back and forth and waiting for catastrophic events to happen in order to starting looking at her more closely. The CT showed the enlarged liver, but again no obvious tumors. Still no answers. We went for an additional ultrasound to see if there was any evidence of a clot anywhere that would be restricting the blood flow through her liver. They didn't find one. Still, no answers. Her condition was obviously precarious, and she needed to be watched. We were admitted. There was a lot going on, and we were feeling the crunch. We were nervous that with the week coming to an end, and a lot of things not available over the weekend, we were going to miss the opportunity to get a leg up on what was going on. There were two possibilities - one is that the neuroblastoma is throughout her liver and that the cells have caused it to become enlarged, and the second is VOD (veno-occlusive disease) which is a side effect of chemo therapy. The only completely conclusive test would be a liver biopsy, but the doctors were not sure that she would be stable enough for one to be done. We had to go to bed that night knowing that we would not know answers right away. This was hard, but we knew that they were working on a plan, and that the plan would be complicated and involve a lot of new and different doctors. All day today we didn't have many answers. We asked a lot of questions, answered the doctors questions, had a lot of examinations, and started to try and piece things together. They gave her some lasics to try and release some of the fluid from her legs and belly (she is up in weight over 5 lbs), and they gave her some red blood cells because she was quite low. Over the course of the day we met some of the different doctors, and waited to hear if she would be able to have a biopsy or not. They got her MIBG scan scheduled, and managed to get the marker to the hospital (which is a feat with twelve hours notice! ), and she was injected for a scan on Friday. We were so glad to be able to have this happen. We really think that it will help to see what is going on sooner and safer than some of the other options. 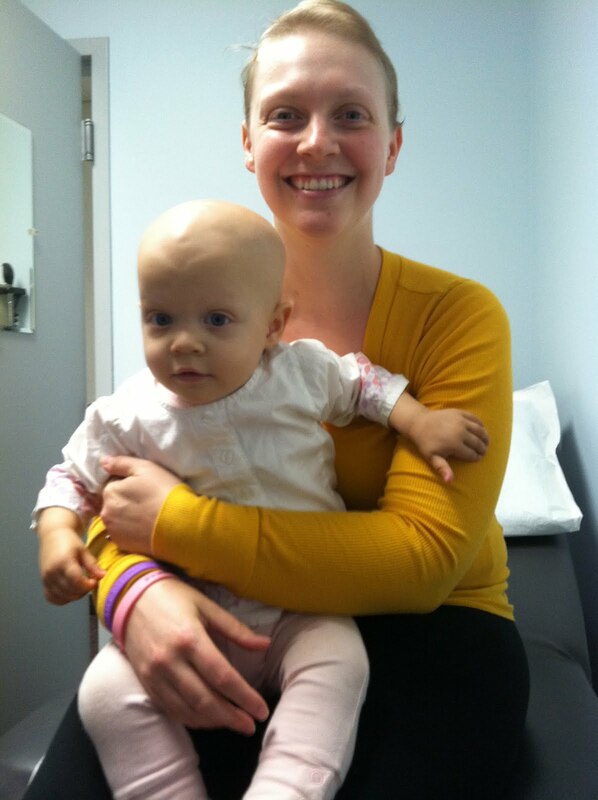 She will also have planning done for radiation so that if it is NB, she will be able to start radiation immediately. We are encouraged by the response in her skull from the last round of radiation, and we are hoping that if it turns out to be NB, it will respond as well to radiation. More waiting, but at least we have a plan. Right now we feel like we are chasing her disease. We can't seem to get ahead of it, and it is taking turns that the doctors don't even know how to look for. It seems to not want to follow any of the things that are readily available, and it seems like it's got a head up on what we are going to throw at it (maybe its a little bit psychic). We are hoping that soon we can finally get ahead of it, and kick it down once and for all. Right now, we just need to figure out what's going on in her enormous liver. I've been thinking of all of you since I heard about your story. I keep checking for updates here and was glad to see one, but was hoping for more good news. I hope you get some answers soon. So many people out here are thinking about your family and sending strength to you and Mike and Saoirse. kezia and mike sending you lots of prayers and positive thoughts i hope you get some answers soon. Saoirse is a beautiful little girl. Sending you prayers and lots of love. God bless! Hey Kez, Mike, and Saoirse - Not much to say but I love you. Stay strong. You will see the end of this. Kazia, Mike and Saoirse! Praying for you all today and every day.. Hope to get a better result and soon catch up with the disease rather than chasing.. I want to see HEALTHY Saoirse soon!!! :) God if you can hear me, please give her health she deserve! Praying for your beautiful daughter and for you both to have strength to deal with this. We just had a 6 week old baby in our town diagnosed with Neuroblastoma. My heart aches for this family as it does yours. I pray that Saoirse responds well to the chemo and pray that the doctors are inspired as to the best treatments for your daughter! God bless you all. I think of you often and pray for you. Praying to God for continued strength and courage. I pray for the doctors and nurses trusted with your precious little one's care, that they find the right direction to take. Most of all I pray for Saoirse, that she feel the love surrounding her, and that she have comfort during this time. No child should ever have to go through this, Kezia; it's okay for you to feel frustrated, hopeless and scared. Lean on those around you, they will hold you up. The waiting is the worst -I am so sorry that your beautiful little girl is having such a tough time! The "hurry up and wait, then wait some more" is so hard to deal with! You want everything now, but things run on "hospital time" which is so difficult. Praying for a good weekend for all of you. Praying for peace as you wait for more treatments. Praying for your beautiful girl and all of you who love her! May God give you all a peace that surpasses all understanding and complete healing and restored health for Saoirse! Hang in there and remain strong for Saoirse. My Christmas wish is simple this year, I wish that you and Saoise have your helth restored and that you all (including Mike) have a very Merry Christmas! What you and your darling baby are going through makes me ashamed of all the times I've complained about my circumstances. You are a wonderful mother. Your child knows you love her and are there for her. Don't ever doubt that. God loves you both, especially when you're hurting so badly that you hardly know where to turn. I'm praying so hard that Saoirse will be better for Christmas and that you will be given the answers you need. May God's love and peace surround you. I don't know you at all, but your whole family is in our prayers. Your little girl has suffered too much in her short life and deserves a break. I just want to hug you all. Rest in peace baby Saoirse. Kezia and Mike, words can't express how sorry I am for your loss. My sister and I have been following your blog for a couple months now. She re-posted a pic of you and your daughter on her facebook page this morning and thats when I found out that Saoirse lost her battle cancer. My heart hurts for you both. I will keep your family in my prayers. We will never forget Saoirse, and we continue to pray for your strength and peace through this difficult time. May God Bless you and your family. You have been through the worst pain a Mom could ever experience. Your little girl changed so many lives and impacted so many people. She was the bravest little girl I've ever known and my heart is aching for you and Mike. My family continues to send you prayers and love. I am a very private person and have never posted before but I want you to know that I am very sorry for your loss....I started following your story because I was also diagnosed with Hodgkins Lymphoma this year and I want you to know that in my prayers for me and my family I also included your family and just this last week I asked God to please help your little girl when I read that you were tired of the torture she was going through...She is no longer in pain. I often drew strength when I thought of your family and your struggle..not only mother with Cancer but a beautiful baby also... Now I will ask God to give you the strength you need to get through this difficult time. Thoughts and prayers are with your family from my family here in Connecticut. I've been following your blogs for months and am so sorry to hear this devastating news. Thank you for being so honest and open and sharing your little girl with the world. I can't imagine what you and your family are going through right now. I'm sure nothing I say can help with the pain you are feeling. I just hope that you know how lucky Saoirse was to have you as a tireless advocate and source of strength and love. It sounds like you did everything you could do to give her the most beautiful life possible under the circumstances. I'm truly heartbroken for you and you and your family are in my thoughts. My heart is just breaking for you and your husband. You are in my thoughts and prayers. Saoirse sounded like a wonderful little girl and I hope the wonderful memories you have of her can help you get through this very difficult time. I know of Saoirse and your family indirectly from Children's when you have come for scans. I can not imagine how you are managing right now. I was so sad to hear the passing of your precious little girl. She made so many people smile-even when she didnt feel like smiling. Your Angel Baby is in Heaven now as you and your husband's guardian-and will always be showering you with love and guidence. The Lord be with you! I am so terribly sorry for your loss. May your memories be magically preserved and may her spirit fill you with love and light. My heart is broken for you, I am so sorry for your loss. We too lost a baby 6 years ago, and I am still always struck by the unfairness and tragedies of life. Your baby is beautiful and lives in the hearts of many forever. Blessings and peace to you and your family. Saoirse's light will always shine. I have followed your blog for the last few months and I am so sorry for your loss. Sending heartfelt sympathy to you and your husband. I will keep you in my thoughts and prayers. God Bless. My thoughts and prayers are with you and your family during this difficult time. I have been following your story since January and I am so touched with the strength and love you, Mike, and Saoirse have. I can't imagine what you are going through but I do know many many people have been following your journey and are praying for you. Saoirse will always be with you and will be your guardian angel. im so sorry about your loss she was a beautiful little girl with amazing eyes. Dear Kezia & Mike, I am so sorry for your loss. We will always remember Saoirse, she will never be forgotten. When I look at my younger son who is her age, I remember your lovely daughter,dancing to tunes of Rivers of Babylon, when my older son watches Curios George, I will remember her smile. She will live forever in our hearts. You were amazing parents and did whatever you could. She was lucky to have you. I pray you will find the strength to go through this. I am crying at work right now as I read that Saoirse has passed away. Everyday I check to see if you have written a new update in the hopes that she is on the mend. You were the best parents. You should be so proud of all you and your daughter has done. Life is so precious. I will give my kids an extra big hug later today. All the best to you and your families in the days and months ahead. My heart breaks of the news I am just reading about Saoirse and her passing. I'm so sorry for you both. I hope you may find some comfort in the knowledge that Saoirse will be remembered and mourned even by people she never met. Her life has been vibrant and has mattered. From one mother to another, prayers and sorrow in this unimaginable time. My heart weeps. Lighting a candle for my little inspiration - Saoirse - RIP little sweetie prayers for Kezia and Mike, and family. Thank you for sharing Saoirse journey with us. I am so sorry for your loss. Thank you for letting us know Saoirse and teaching us about her disease. May your family find comfort in all the simple ways that people are reaching out to you. The strength of your family alone is enough to know you're great people, but your faith and perseverance show your true character. I don't know if you imagined your story or your words would touch so many lives, but it has. We are all grieving your loss with you and although we can take comfort that she's with God and will never feel sorrow or pain again I can only pray that there is mercy with your grieving. Please know that you and your family have made a differnce in this world and know that because of you, I have been inspired to fihgt the cancer fight even harder. Our prayers are with you. I am truely so sorry for your family's loss. I have been reading your blog from day one and can't even begin to imagine the pain you and your family are going through right now. Saoirse is truly a angel and you and Mike did an amazing job taking care of her. Life is so precious. Your angel is now in heaven. I will continue to pray for you and your family during this difficult time. I can only hope that God sent Saoirse to you for such a short time to show you that your own life is precious and to help give you the strength to fight your own battle. What a child gives a parent can't be compared, whether you experiece that only for a day, a month, a year or a lifetime - you HAD it!! And it is an amazing wonder - lock that love in your heart and live each of your days with the memory of her pure love and goodness. I don't know you - but you are forever in my thoughts and prayers. I am so sorry for your loss and thank you for sharing Saoirse's life with us via this blog. I am so sorry for your loss. What a sweet, beautiful girl you have. Rest in peace, darling Saoirse - you are loved and missed. My thoughts are with you. Just read your story on cnn.com. I will hug my little boys today and wish you all well.